Etsy Treasury: Got a Secret, Can you Keep It? Voting runs from February 11 to March 8, and winners will be announced on March 15. In the category of Best Miniature Blog are are some of my favorites, that I'm sure are familiar to my readers. Congratulations, ladies! Help! My house is frozen and I can't get out! Can someone come kick in the door for me? We got an unbelievable amount of rain and ice here the last two days. The trees are beautiful, they look like they've been carved out of frozen crystal. It looks like something out of a fairy tale. If I could get my door open I'd take a picture for you! 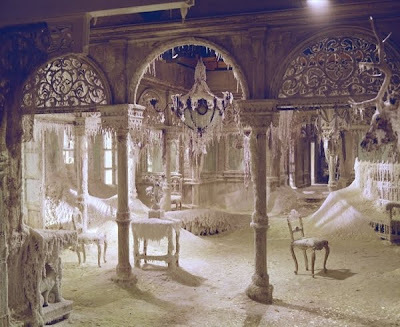 Photo: Ice palace from Dr. Zhivago (1965). Treasury alert! 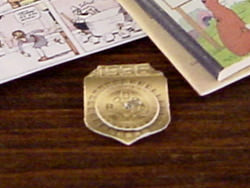 My little Radio Orphan Annie Set with Decoder Badge has been included in an Etsy treasury curated by VintageInBloom, Got a Secret, Can you Keep It? All sorts of cool top secret gifts and artwork, check it out! 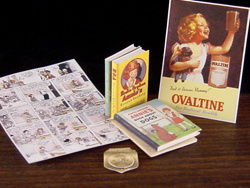 You can purchase the miniature "Radio Orphan Annie Set" set on my website.